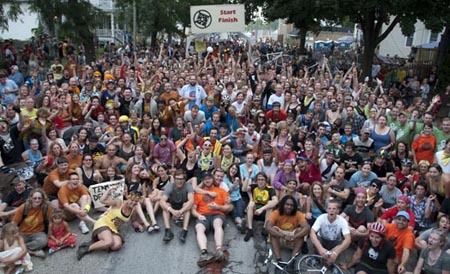 The 2011 and 4th Annual Riverwest 24 Bike Race starts Friday, July 29 at 7PM and finishes Saturday, July 30 at 7PM. All slots are filled but you can watch – or better yet, volunteer. Wendy Mesich is the volunteer coordinator. Paul Kjelland photo at thestart/finish line, 2010.